The Withings Activité blew us away in 2014 with its super stylish looks effortlessly blurring the lines between a regular wristwatch and a fitness tracker, and now the French wearable specialist is back for more, with the more affordable Withings Activité Pop. 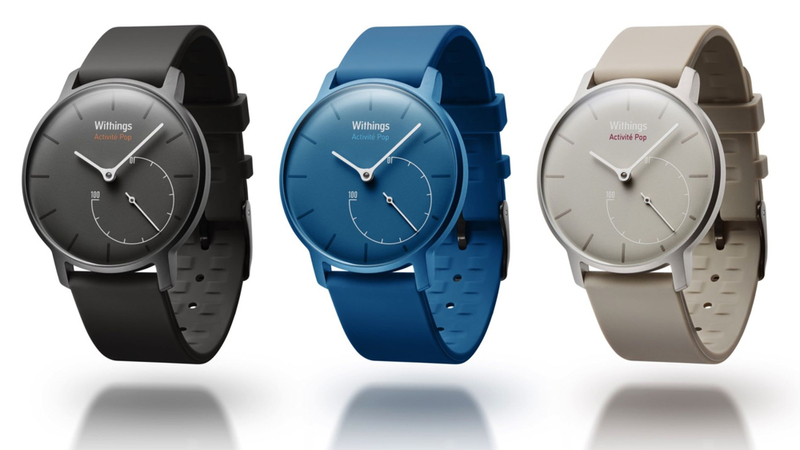 Costing £320/$450, the original 'Swiss Made' Activité used premium materials such as scratch-proof domed sapphire glass, stainless steel and calf leather - the Withings Activité Pop uses a PVD-coated metal and a silicone strap, resulting in a price of less than $150. The functionality remains the same as its more expensive brethren, however, with fitness and sleep tracking on board, and it uses the same Withings HealthMate app. The only hint of any activity recording is the small 0-100 dial that represents a wearer's progression towards their daily goals. Coming in three colours, azure, shark grey, and sand - that's blue, grey and beige to normal people - the battery life is an estimated 8 months and the Withings Pop is waterproof to 30m. The Pop is another indicator that Withings gets wearables. The original Activité was expensive, but then Swiss-crafted watches usually are. The Pop is much more in line with the Casios and Swatches of this world. Costing $149.95 in the States, £119.95, the Withings Activité Pop will go on limited release through Best Buy and Harrods later this month, with a wider launch planned for March. We'll be bringing you a hands-on Withings Activité Pop review ASAP. Wareable is reporting live from CES 2015 - make sure you bookmark our dedicated CES homepage.